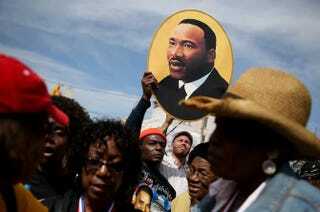 A picture of Martin Luther King Jr. is held up before marchers walk across the Edmund Pettus Bridge in Selma, Ala., March 8, 2015, during the 50th anniversary commemoration of the Selma to Montgomery civil rights march. A statue of civil rights icon Martin Luther King Jr. is scheduled to be erected on the Georgia Statehouse grounds, a short distance away from the newly opened Liberty Plaza, where demonstrations are now held, the Atlanta Journal-Constitution reports. The 8-foot statue will be set on a 3-foot base and will include King quotes on all four sides, the news site notes. It will also overlook a road named in the civil rights leader’s honor. Georgia artist Andy Davis has been commissioned to design the statue and is expected to take six to seven months to complete. The total cost of the monument is currently estimated at $350,000. According to the AJC, the statue is “long overdue,” first announced by Gov. Nathan Deal just last year, after years of lobbying by black leaders. Deal signed an order in 2013 to remove a statue dedicated to segregationist U.S. Sen. Tom Watson. The AJC notes that since then, Democrats have been pushing to have a statue of King replace it. Because 2014 was an election year, however, the monument was moved to the back burner until now, with the state recently coming to an agreement with the King family’s intellectual-property attorneys. As the site notes, the announcement comes at a time when tensions are high in the nation, with a Confederate flag debate continuing in the wake of the massacre at Charleston, S.C.’s Emanuel African Methodist Episcopal Church. Georgia has not escaped the discussion, given its own background. According to the AJC, Democrats are currently encouraging the state to stop celebrations of Confederate Memorial Day and Confederate Heritage Month. The state has, however, stopped selling license plates bearing the controversial symbol.